Ultrabook and laptop users who have been eyeing the five-star rated Dell XPS 13 ($799, £526, AU$1,050) with its infinity display – sporting ultra-thin screen bezels – will soon have a bigger option to choose from. 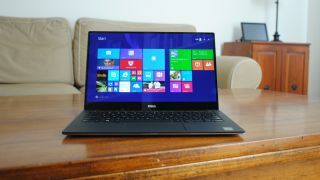 At a meeting at Dell's Round Rock headquarters in Austin, Texas last week, Ken Musgrave, Dell's executive director of design, told TechRadar that Microsoft will showcase a newly redesigned Dell XPS 15 on stage at the Computex 2015 keynote. Like the Dell XPS 13, the marquee feature of the XPS 15 is its gorgeous display, which is further highlighted by ultra-thin screen bezels. This makes the laptop appear more compact than it really is – slimmer bezels around the display means that the laptop occupies a smaller footprint. Update: We've attached images of the Dell XPS 15 from the Microsoft keynote at Computex 2015 below. Dell briefly showed me a non-working prototype of the XPS 15 during our meeting. Aesthetically, the XPS 15 maintains the same design language as the XPS 13 – which is pictured above – complete with a carbon fiber keyboard deck and metal case. Erin Walline, Dell's director of engineering of user experience and design, was quick to note that while the XPS 13 is a 13-inch notebook that's as compact as an 11-inch, the 15-inch is a larger Ultrabook that can't be made as diminutive. As such, the biggest appeal to the XPS 15 would be the minimal bezels rather than the shrunken size. The current XPS 15, which debuted in early 2014, measures 14.6 x 10.0 x 0.3-0.7 inches (372mm x 254mm x 8-18mm) and weighs 4.9 pounds (2.22kg). Dell did not provide us with measurements and weight for the 2015 model. Beyond the design, Dell would not comment on the laptop's specifications or features, saying that the information will be coming later this year ahead of the official availability. This year's XPS 13 launched with Intel's Broadwell processors, and it's unclear at this time whether the XPS 15 will also debut with Broadwell, or if Intel's Sixth Generation Skylake processors with improved integrated graphics will be ready. Although Dell offered a brilliant QHD upgrade option for the display of the XPS 13, it's unclear if higher resolutions will be made available for this year's XPS 15. The current Dell XPS 15 comes with a 4K UHD touch panel option. Dell would not comment on when the laptop will be available. For reference, the current XPS 15 costs $1,599 (£1,052, AU$2,102) with an Intel Haswell processor. The XPS 13 starts at $799 (£526, AU$1,050) without touch, and adding a QHD touchscreen panel takes the price up to $1,599 (£1,052, AU$2,102). Given that the XPS 15 was used to show off Windows 10's features at Computex, the laptop will likely ship with the operating system, meaning that it may not arrive until July 29 at the earliest, the date that Windows 10 will be made available for consumers.